Oryza communissima, O. praecox, O. montana, O. glutinosa Lour. ; O. palustris Salisb. ; O. latifolia Beauv. ; O. parviflora Beauv. ; O. rubribarbis(Desv.) Steud. ; O. sofghoides Steud. The root system of the rice plant has a very specific feature: the aerenchyma, a tissue with air-conducting cavities. The air reaches root aerenchyma via leaf stomae and stalks. Thus, the air is supplied not only to the root but also to all of the surrounding area, which favors the development of active soil microflora in rice fields. Rice's stalk is a straw with hollow internodes. Stalk length varies from 0.3 m (with dwarf varieties) to 6 m (with lowland rice). In most cases, it is 0.5 to 2 m long. The straw of Japanese rice subspecies is shorter than that of Indian rice subspecies. The number of nodes depends on the duration of the vegetation period (early-maturing varieties have about 10 internodes; late-maturing varieties have as many as 20). Unlike other gramineous crops, rice has two coleoptile leaves located one after another. The first one is a true achlorophyllous coleoptile. The second one is a green awl. All leaves of the rice plant, except for the first two, have a sheath, a lamella, a ligule and auricles. The leaf lamella is long and narrow (20 to 25 cm long and 1 to 2 cm wide). The uppermost leaf, called the standard, has a lamella which is shorter and wider than that of the other leaves. The bushing-out node forms 2 to 40 lateral shoots. Rice plants may also have branching-out shoots which develop from axillary leaf buds after rice plants have been submerged in water for a long time. Rice inflorescence is a panicle with 20 to 300 spikelets, which are 10 to 30 cm long. Panicles may be drooping, upright or intermediate. The degree to which rice plants shed their kernels depends on the structure of the spikelet joint where the spikelet is joined to the stem. Spikelets have small upper and lower lanceolate glumes. Their length usually is one third or one half that of the flowering glumes' length. Each spikelet has a single flower, which consists of lower and upper flowering glumes, two lodicules, six stamens and the pistil, which has two plumose stigmae. With aristate varieties, the lower flowering glume ends in an awn, which may be up to 15 cm long. The anthers are small (0.5 cm). Each one contains about 1000 pollen grains. Pollen grains are round, 35 to 38 micrometers in diameter. The ovary is formed by three carpels. Rice fruit is a caryopsis. After threshing, it remains inside lodicules, even though it is not accrete with them. The weight of rice glumes and lodicules accounts for 10 to 35% of its kernels' weight. 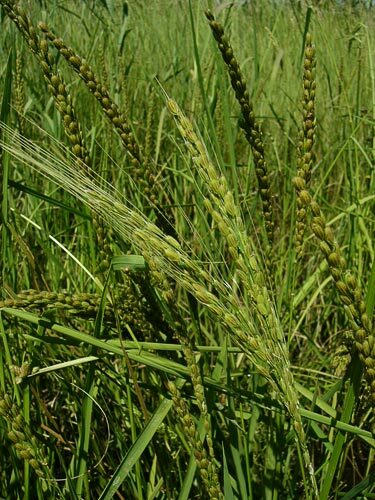 1000 kernels (with glumes) weigh 27 to 34 g.
Rice is a spring, heat-loving and very hygrophilous plant. The effective heat sum (above 15°C) necessary for it to mature is no less than 2000°C. Its vegetation period lasts for 90 to 165 days. Rice is a short daylight plant. When it is cultivated farther north, its vegetation period becomes longer (thus rice varieties bred in the Philippines cannot mature in Russia, though the effective heat sum there may be sufficient). Breeding of rice varieties indifferent to photoperiod is important not only for European countries but also for the USA, India and Mexico. World rice gene pool contains varieties with different photoperiodic sensitivities. There are even varieties which mature with 24-hours' daylight. Indifference to photoperiod as a rule comes together with low height and early maturity. Rice is cultivated on lands irrigated by rice irrigation systems or in areas with much precipitation (no less than 1800 to 2000 mm a year). In order to assure seeds' germination, the upper soil layer is wetted. During the bushing-out, leaf-tube-formation and panicle-emergence phases, rice cultivation basins are flooded with 15 to 25 cm of water. Before harvesting, the water is drained. Rice thrives on black earth and on chestnut and flood plain soils. Rice is a self-pollinating plant. Cross-pollination with rice usually does not exceed 1 to 2% of cases but sometimes occurs in as many as 7% of cases. Closed flowering of rice plants has been observed with unfavorable temperatures and humidity. Optimal flowering conditions for rice exist at temperatures about 30°C and relative humidity of 70%. Rice begins to blossom from the upper part of the panicle either at the beginning of its emergence or the next day. The most intensive panicle blossoming has been observed on the 2nd or 3rd day. Blossoming lasts for 5 to 7 days. Each spikelet begins to blossom when the stamens are at two thirds of the flower's height. As soon as the flower opens (1 to 3 minutes), the anthers burst, and the pollen reaches the stigma. When outside anthers are already almost empty, the flowers remain open for 0.5 to 2.5 hours. Embryo and endosperm formation occurs after fertilization. Embryo differentiation begins on day 5 to 7 and finishes on day 11 to 12. However, the embryo only gains its definite size and weight on day 27 after fertilization. The caryopsis matures for 30 to 40 days. Milky ripeness (11 to 12 days), wax ripeness (20 days) and full ripeness (5 to 7 days) are distinguished from one another. Rice plants consume twice as much nitrogen as any other mineral nutrients. Rice contains and consumes a lot of silicon (a few times more than phosphorus or potassium). It is suitable for cloning (grafting, eddish growing). As compared to other gramineous crops, rice seeds in the field do not germinate well (10 to 40%). At optimal temperatures of 27 to 33°C, rice takes 2 to 3 days to germinate. At temperatures of 15 to 18°C, it takes 12 to 15 days to germinate. The minimum temperature for petiole and radicle formation is 13 to 14°C. At temperatures of 10 to 12°C, germination is inhibited. The biggest kernel yield is to be expected from rice plants with 3 to 5 lateral shoots whose panicles mature at the same time as the panicle of the main shoot. Therefore, high productive bushing-out is one of the requirements for the newly bred rice varieties. Panicle productivity depends on its length, density, the number of kernels in it and the weight of 1000 kernels. 90% of each panicle consists of kernels. Resistance to lodging depends on three rice features: stalk strength, height and panicle weight. The most important factor is the stalk height (the higher it is, the likelier rice is to lodge). Rice lodging also depends on the angle of bushing-out between the lateral shoots and the main one, the most favorable angle being 30 to 35°. There is a direct correlation between the strength of the straw and the strength of the roots. Rice's ability to tolerate salt is inferior to that of many other cultivated plants, including wheat. If soil salinization occurs, rice plants are ruined or yield very little (the number of hollow grains increases greatly, the leaves' area decreases, the weight of 1000 kernels decreases, the stalks become shorter, the generative organs develop poorly, and fewer seeds germinate). Rice is mostly cultivated in Asia. Over 90% of lands sown with this crop are there (88.5% of world rice production). 3% of lands sown with rice are in Africa, 6% in America. Rice is one of the oldest cultivated plants. Its cultivation began in Southeast Asia over 7 thousand years ago. The oldest rice-producing areas are India and China. In Transcaucasia and Central Asia, rice has been cultivated since the 2nd or 3rd centuries B.C., in Europe since the 8th century A.D., and in America since the 15th or 16th centuries A.D. African rice (O. glaberrima) is common in Western Africa. Kernels of some African wild rice varieties, e.g. red rice (O. punctata) and wetland wild rice (O. breviligulata) are consumed as food by local populations. The largest areas sown with rice are found in India, China and Indonesia. In the Russian Federation, rice is cultivated in Northern Caucasia, in the Lower Volga Region and in Primorye. In 2001, rice was cultivated on 154 thousand hectares on all categories of farms (or on 0.3% of all lands sown with grain crops). In the former republics of the USSR, rice is cultivated in Central Asian republics in Kazakhstan and in the Ukraine. In 2004, 32 rice varieties were approved for cultivation in specific areas of the Russian Federation. The main varieties include Blagodarny, Dalnevostochny, Dary 23, Zhenchug, Zlaty, Izumrud, Kuban' 3, Lider, Liman, Razdolny, Sadko, Sprint, Spalchik, Khankaysky 429, Khankaysky 52, and Yantar'. The breeding agencies include All-Union Rice Research Institute, Primorye Research Institute for Agriculture, All-Union Research Institute for Sorghum and Other Grain Crops, and Primorye Research Experimental Rice-Breeding Station of Primorye Research Institute for Agriculture. Rice is a staple cultivated crop. The area of the lands sown with rice is the second largest in the world (about 145 million hectares), while the yield of rice is the greatest in the world (over 3,000 kg per hectare). Annual world rice production in the mid 1980s amounted to 465,000,000,000 kg. Rice is mainly intended for human consumption. For 1.6 billion people, it makes up half of their food supply, while for another 400 million people, it is 25 to 50% of their food supply. As compared to other bread grains, rice kernels have the greatest starch content (85 to 92%). Rice protein's lysine content is the highest among plant proteins. Rice protein is a plant protein closest to animal proteins. A rice kernel contains 7 to 8% of this protein. 96% of rice is digestible. Rice kernels are used to produce cereal, starch, and oil (from rice embryos); rice straw is used to produce paper, cardboard, and wicker goods. Rice bran is very high in protein (13.7%), grass (14%), and substances containing phosphorus (phytin, lecithin). It is used for oil production and as fodder for young livestock. Rice yields are the greatest of all the grain crops. Rice may yield up to 50,000 kg per hectare. In Australia, one hectare of rice yielded 12,500 kg of kernels. At present, rice yield in the Russian Federation is 3,490 kg per hectare. Rice is cultivated as a part of rice crop rotation. Its precursors are perennial herbs and full fallow (after these, rice can be cultivated for 2 to 3 consecutive years). 60 to 150 kg of N, 90 kg of P2O5, and 60 kg of K2O are applied per hectare. The normal amount of irrigation water is 12 to 20 thousand cubic meters of water per hectare. Rice is sown with common drill techniques. 250 to 300 kg of rice seeds are planted per hectare. The planting depth is 1.5 to 2 cm. Rice is harvested with two-phase techniques and with direct combined harvesting upon application of desiccants. Rice irrigation system is used to irrigate rice and its companion crops. It consists of canals and irrigation and water drainage networks, of irrigation lots divided into basins by low banks, of such facilities as water-supply points, pumping plants and settling tanks, of a road network, of forest shelter-belts, and of equipment and buildings for operational needs. The most common rice irrigation systems in the Russian Federation are of Krasnodar, Kuban' and Far Eastern types, which differ in the size of basins, their shape and water-supply and drainage techniques. Cherepanov S.K. 1995. Vascular Plants of Russia and Neighboring Countries. St. Petersburg. pp. 732-733. Konovalov Y.B., ed. 1990. Particular Breeding of Field Crops. Moscow. pp. 158-178. State Register Breeding Achievements Approved for Practical Application. 2004. Moscow, p. 19. Suvorov V.V. 1961. Botany. Leningrad. p. 421. Zhukovsky P.M. 1971. Cultivated Plants and Their Congeners. Leningrad. pp. 206-215.